(iii) is above the minimum mass/size requirement for planetary status in the Solar System. 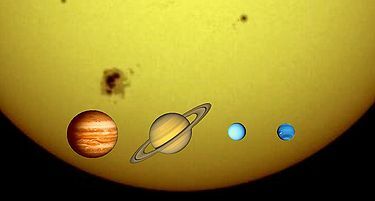 Our solar system is thus considered to have eight planets: Mercury, Venus, Earth, Mars, Jupiter, Saturn, Uranus, and Neptune. Pursuant to a separate resolution, the IAU has designated three dwarf planets: Ceres, Pluto, and Eris. There have been more than two hundred planets discovered orbiting other stars to date. Historically, there had been no formal scientific definition of "planet" and without one, the solar system had been considered to have various planets over the years. This changed when a resolution covering planets within our solar system was formally adopted by the IAU in 2006, limiting the number to eight. However, the IAU's position on those in other systems remains only a working definition in place since 2003, and as such, is easily subject to change. The IAU has not yet taken a position on free-floating objects of planetary mass outside star systems, other than to exclude those in young star clusters. In ancient times, astronomers noted how certain lights moved across the sky in relation to the other stars. These objects were believed to orbit Earth, which was considered to be stationary. The "wandering" lights were first called "πλανήτης" (planētēs) by the Ancient Greeks, a Greek term meaning "wanderer," and it is from this that the word "planet" was derived. In near-universal practice in the Western world, the planets in the solar system are named after Graeco-Roman gods, as, in Europe, it was the Greeks who named them, although the practice of naming planets after gods originated in the West with the Sumerians, who lived in modern-day Iraq in about 3000 B.C.E. Successive Mesopotamian civilizations, such as the Babylonians, retained the Sumerian naming convention but adapted it to their own very different pantheons. The Greeks borrowed much of their astronomy, including constellations and the zodiac, from the Babylonians, and by 600 B.C.E. had already begun using Babylonian concepts in their calculations. 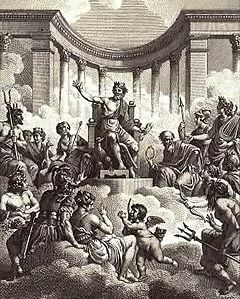 The Greeks grafted the names of their own gods onto the Babylonian planet list, although there was some confusion in translation: for instance, the Babylonian Nergal was a god of war, and the Greeks, seeing this aspect of Nergal's persona, identified him with Ares, their god of war. However, Nergal, unlike Ares, was also a god of the dead and a god of pestilence. Because of the influence of the Roman Empire and, later, the Roman Catholic Church, in most countries in the West the planets are known by their Roman (or Latin) names rather than the Greek. The Romans, who, like the Greeks, were Indo-Europeans, shared with them a common pantheon under different names but lacked the rich narrative traditions that Greek poetic culture had given their gods. During the later period of the Roman Republic, Roman writers borrowed much of the Greek narratives and applied them to their own pantheon, to the point where they became virtually indistinguishable. When the Romans studied Greek astronomy, they gave the planets their own gods' names. In ancient times, there were five known planets; each presumed to be circling Earth according to the complex laws laid out by Ptolemy in the second century. They were, in the increasing order from the Earth: Mercury (called Hermes by the Greeks), Venus (Aphrodite), Mars (Ares), Jupiter (Zeus), and Saturn (Kronos). Although strictly the term "planetes" referred only to those five objects, the term was often expanded to include the sun and the moon. Eventually, the Earth was added to the list of planets and the sun and moon were dropped in accordance with the heliocentric model. However, when subsequent planets were discovered in the eighteenth and nineteenth centuries, the naming practice was retained: Uranus (Ouranos) and Neptune (Poseidon). The Greeks still use their original names for the planets. Some Romans, following a belief imported from Mesopotamia into Hellenistic Egypt, believed that the seven gods after whom the planets were named took hourly shifts in looking after affairs on Earth, in Ptolemaic orbit order listed inwards. As a result, a list of which god has charge of the first hour in each day came out as sun, moon, Mars, Mercury, Jupiter, Venus, Saturn, i.e. the usual weekday name order. Sunday, Monday, and Saturday are straightforward translations of these Roman names. In English the other days were renamed after Tiw, Wóden, Thunor, and Fríge, gods considered similar or equivalent to Mars, Mercury, Jupiter, and Venus respectively. Since Earth was only generally accepted as a planet in the seventeenth century, there is no tradition of naming it after a god. Many of the Romance languages (including French, Italian, Spanish and Portuguese), which are descended from Latin, retain the old Roman name of Terra or some variation thereof. However, the non-Romance languages use their own respective native words. Again, the Greeks retain their original name, Γή (Ge or Yi); the Germanic languages, including English, use a variation of an ancient Germanic word ertho, "ground," as can be seen in the English Earth, the German Erde, the Dutch Aarde, and the Scandinavian Jorde. The same is true for the Sun and the Moon, though they are no longer considered planets. Some non-European cultures use their own planetary naming systems. China and the countries of eastern Asia subject to Chinese cultural influence, such as Japan, Korea and Vietnam, use a naming system based on the five Chinese elements. As scientific knowledge progressed, understanding of the term "planet" changed from something that moved across the sky (in relation to the starfield) to a body that orbited Earth (or that were believed to do so at the time). When the heliocentric model gained sway in the sixteenth century, it became accepted that a planet was actually something that orbited the sun, and Earth was itself a planet, and the sun and moon were not. Until the mid-nineteenth century, any newly discovered object orbiting the sun was listed with the planets by the scientific community, and the number of "planets" swelled rapidly towards the end of that period. During the 1800s, astronomers began to realize most recent discoveries were unlike the traditional planets. They shared the same region of space, between Mars and Jupiter, and had a far smaller mass. Bodies such as Ceres, Pallas, and Vesta, which had been classed as planets for almost half a century, became classified with the new designation "asteroid." From this point, a "planet" came to be understood, in the absence of any formal definition, as any "large" body that orbited the sun. There was no apparent need to create a set limit, as there was a dramatic size gap between the asteroids and the planets, and the spate of new discoveries seemed to have ended after the discovery of Neptune in 1846. However, in the twentieth century, Pluto was discovered. After initial observations led to the belief it was larger than Earth, the recently-created IAU accepted the object as a planet. Further monitoring found the body was actually much smaller, but, as it was still larger than all known asteroids and seemingly did not exist within a larger population, it kept its status for some seventy years. In the 1990s and early 2000s, there was a flood of discoveries of similar objects in the same region of the solar system. Like Ceres and the asteroids before it, Pluto was found to be just one small body in a population of thousands. A growing number of astronomers argued for it to be declassified as a planet, since many similar objects approaching its size were found. The discovery of Eris, a more massive object widely publicized as the tenth planet, brought things to a head. The IAU set about creating the definition of planet, and eventually produced one in 2006. The number of planets dropped to the eight significantly larger bodies that had cleared their orbit (Mercury, Venus, Earth, Mars, Jupiter, Saturn, Uranus, and Neptune), and a new class of dwarf planets was created, initially containing three objects (Ceres, Pluto, and Eris). Sun Antiquity to 1600s Center Star Planet under the geocentric model. Moon Antiquity to 1600s Earth's orbit Satellite Planet under the geocentric model. Ceres 1801-1864 Asteroid belt Dwarf planet Asteroid until at least 2006. Pluto 1930-2006 Kuiper belt Dwarf planet Officially accepted by IAU for this period. With the discovery during the latter half of the twentieth century of more objects within the solar system and large objects around other stars, dispute arose over what should constitute a planet. There was particular disagreement over whether round objects that existed in belts, and large deuterium fusing objects should qualify. 2) Substellar objects with true masses above the limiting mass for thermonuclear fusion of deuterium are "brown dwarfs," no matter how they formed nor where they are located. 3) Free-floating objects in young star clusters with masses below the limiting mass for thermonuclear fusion of deuterium are not "planets," but are "sub-brown dwarfs" (or whatever name is most appropriate). 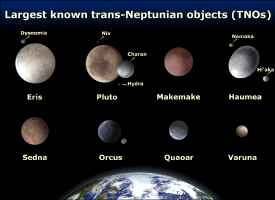 The largest Trans-Neptunian objects that prompted the IAU's decision. Under this definition, the solar system is considered to have eight planets. Bodies which fulfill the first two conditions but not the third (such as Pluto and Eris) are classified as dwarf planets, providing they are not also natural satellites of other planets. Originally an IAU committee had proposed a definition that would have included a much larger number of planets as it did not include (c) as a criterion. After much discussion, it was decided via a vote that those bodies should instead be classified as dwarf planets. In the aftermath of the IAU's 2006 vote, there was criticism of the new definition. 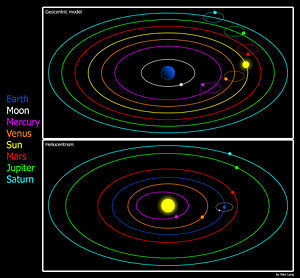 Part of the dispute centers around the belief that point (c) (clearing its orbit) should not have been listed, and that those objects now categorized as dwarf planets should actually be part of a broader planetary definition. Beyond the scientific community, Pluto has held a strong cultural significance for many in the general public considering its planetary status during most of the twentieth century, in a similar way to Ceres and its kin in the 1800s. More recently, the discovery of Eris was widely reported in the media as the "tenth planet." The reclassification of all three objects as dwarf planets has attracted much media and public attention. It is not known with certainty how planets are formed. The prevailing theory is that they are formed from those remnants of a nebula that do not condense under gravity to form a protostar. Instead, these remnants become a thin, protoplanetary disk of dust and gas revolving around the protostar and begin to condense about local concentrations of mass within the disc known as planetesimals. These concentrations become ever more dense until they collapse inward under gravity to form protoplanets. After a planet reaches a diameter larger than Earth's moon, it begins to accumulate an extended atmosphere. This serves to increase the capture rate of the planetesimals by a factor of ten. When the protostar has grown such that it ignites to form a star, its solar wind blows away most of the disc's remaining material. Thereafter there still may be many protoplanets orbiting the star or each other, but over time many will collide, either to form a single larger planet or release material for other larger protoplanets or planets to absorb. Those objects that have become massive enough will capture most matter in their orbital neighborhoods to become planets. Meanwhile, protoplanets that have avoided collisions may become natural satellites of planets through a process of gravitational capture, or remain in belts of other objects to become either dwarf planets or small solar system bodies. The energetic impacts of the smaller planetesimals will heat up the growing planet, causing it to at least partially melt. The interior of the planet begins to differentiate by mass, developing a denser core. Smaller terrestrial planets lose most of their atmospheres because of this accretion, but the lost gases can be replaced by outgassing from the mantle and from the subsequent impact of comets. Smaller planets will lose any atmosphere they gain through various escape mechanisms. With the discovery and observation of planetary systems around stars other than our own, it is becoming possible to elaborate, revise or even replace this account. The level of metallicity is now believed to determine the likelihood that a star will have planets. Hence it is thought less likely that a metal-poor, population II star will possess a more substantial planetary system than a metal-rich population I star. Terrestrials: Planets (and possibly dwarf planets) that are similar to Earth—with bodies largely composed of rock: Mercury, Venus, Earth, and Mars. If including dwarf planets, Ceres would also be counted, with as many as three other asteroids that might be added. Gas giants: Planets with a composition largely made up of gaseous material and are significantly more massive than terrestrials: Jupiter, Saturn, Uranus, and Neptune. Ice giants are a sub-class of gas giants, distinguished from gas giants by their depletion in hydrogen and helium, and a significant composition of rock and ice: Uranus and Neptune. Ice dwarfs: Objects that are composed mainly of ice, and do not have planetary mass. The dwarf planets Pluto and Eris are ice dwarfs, and several dwarf planetary candidates also qualify. 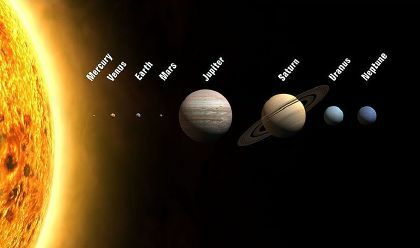 All the planets revolve around the sun in the same direction—counter-clockwise as seen from over the sun's north pole. The period of one revolution of a planet's orbit is known as its year. A planet's year depends on its distance from the sun. The farther a planet is from the sun, not only must it travel a longer distance but also its speed is slower, as it is less affected by the sun's gravity. The planets also rotate around invisible axes through their centers. The period of one rotation of a planet is known as its day. All the planets rotate in a counter-clockwise direction, except for Venus, which rotates clockwise. There is great variation in the length of day between the planets, with Venus taking 243 Earth days to rotate, and the gas giants only a few hours. Planets also have varying degrees of axial tilt; they lie at an angle to the plane of the sun's equator. This causes the amount of sunlight received by each hemisphere to vary over the course of its year; when the northern hemisphere points away from the sun, the southern hemisphere points towards it, and vice versa. Each planet therefore possesses seasons; changes to the climate over the course of its year. The point at which each hemisphere is farthest/nearest from the sun is known as its solstice. Each planet has two in the course of its orbit; when a planet's northern hemisphere has its summer solstice, when its day is longest, the southern has its winter solstice, when its day is shortest. Jupiter's axial tilt is very small, so its seasonal variation is minimal; Uranus, on the other hand, has an axial tilt so extreme it is virtually on its side, which means that its hemispheres are either perpetually in sunlight or perpetually in darkness around the time of its solstices. All of the planets have atmospheres as their large masses mean gravity is strong enough to keep gaseous particles close to the surface. The larger gas giants are massive enough to keep large amounts of the light gases hydrogen and helium close by, although these gases mostly float into space around the smaller planets. Earth's atmosphere is greatly different to the other planets because of the various life processes that have transpired there, while the atmosphere of Mercury has mostly, although not entirely, been blasted away by the solar wind. Many of the planets have natural satellites, called "moons," regardless of their size. The gas giants all have numerous moons in complex planetary systems. Many gas giant moons have similar features to the terrestrial planets and dwarf planets, and some have been studied for signs of life. *Measured relative to Earth. **See Earth article for absolute values. *Measured relative to the Earth. By definition, all dwarf planets are members of larger populations. Ceres is the largest body in the asteroid belt, while Pluto is a member of the Kuiper belt and Eris is a member of the scattered disc. According to Mike Brown there may soon be over forty trans-Neptunian objects that qualify as dwarf planets under the IAU's recent definition. Of the 209 extrasolar planets (those outside the solar system) discovered as of November 2006, most have masses which are about the same as, or larger than, Jupiter. Exceptions include a number of planets discovered orbiting burned-out star remnants called pulsars, such as PSR B1257+12, the planets orbiting the stars Mu Arae, 55 Cancri and GJ 436, which are approximately Neptune-sized, and a planet orbiting Gliese 876 that is estimated to be about six to eight times as massive as Earth and is probably rocky in composition. It is far from clear if the newly discovered large planets would resemble the gas giants in the solar system or if they are of an entirely different type as yet unknown, like ammonia giants or carbon planets. In particular, some of the newly discovered planets, known as “hot Jupiters,” orbit extremely close to their parent stars, in nearly circular orbits. They therefore receive much more stellar radiation than the gas giants in the solar system, which makes it questionable whether they are the same type of planet at all. There is also a class of “hot Jupiters” that orbit so close to their star that their atmospheres are slowly blown away in a comet-like tail: the Chthonian planets. Several projects have been proposed to create an array of space telescopes to search for extrasolar planets with masses comparable to the Earth. The NASA Terrestrial Planet Finder was one such program, but as of February 2006 this program had been put on indefinite hold. The European Space Agency is considering a comparable mission called “Darwin.” The frequency of occurrence of such terrestrial planets is one of the variables in the Drake equation which estimates the number of intelligent, communicating civilizations that exist in our galaxy. In 2005, astronomers detected a planet in a triple star system, a finding that challenges current theories of planetary formation. The planet, a gas giant slightly larger than Jupiter, orbits the main star of the HD 188753 system, in the constellation Cygnus, and is hence known as HD 188753 Ab. The stellar trio (yellow, orange, and red) is about 149 light years from Earth. The planet, which is at least 14 percent larger than Jupiter, orbits the main star (HD 188753 A) once every 80 hours or so (3.3 days), at a distance of about 8 Gm, a twentieth of the distance between Earth and the sun. The other two stars whirl tightly around each other in 156 days, and circle the main star every 25.7 years at a distance from the main star that would put them between Saturn and Uranus in the solar system. The latter stars invalidate the leading hot Jupiter formation theory, which holds that these planets form at "normal" distances and then migrate inward through some debatable mechanism. This could not have occurred here; the outer star pair would have disrupted outer planet formation. Several computer simulations of stellar and planetary system formation have suggested that some objects of planetary mass would be ejected into interstellar space. Some scientists have argued that such objects found roaming in deep space should be classed as "planets." However, many others argue that only planemos that directly orbit stars should qualify as planets, preferring to use the terms "planetary body," "planetary mass object" or "planemo" for similar free-floating objects (as well as planet-size moons). The IAU's working definition on extrasolar planets takes no position on the issue. The discoverers of the bodies mentioned above decided to avoid the debate over what constitutes a planet by referring to the objects as planemos. However, the original IAU proposal for the 2006 definition of planet favored the star-orbiting criterion, although the final draft avoided the issue. ↑ 1.0 1.1 IAU 2006 General Assembly: Result of the IAU Resolution votes. Retrieved May 6, 2015. ↑ 2.0 2.1 Working Group on Extrasolar Planets (WGESP) of the International Astronomical Union. Retrieved May 6, 2015. ↑ 3.0 3.1 Jean Schneider, Interactive Extra-solar Planets Catalog. The Extrasolar Planets Encyclopaedia. Retrieved December 26, 2007. ↑ Gary D. Thompson, “A Chronological History of Babylonian Astronomy.” Retrieved May 6, 2015. ↑ Kelley L. Ross, “The Days of the Week.” Retrieved December 26, 2007. ↑ Theoi Project, Astra Planeta. Retrieved December 26, 2007. ↑ Bill Arnett, Appendix 5: Planetary Linguistics, Nineplanets.org. Retrieved December 26, 2007. ↑ 8.0 8.1 Michael Falk, “Astronomical Names for the Days of the Week,” Journal of the Royal Astronomical Society of Canada 93 (1999): 122-133. Abstract available online. Retrieved December 26, 2007. ↑ Steven Soter, “What is a Planet,” Astronomical Journal 132 (6) (December 2006): 2513–2519. Available online. Retrieved December 26, 2007. ↑ G. W. Wetherill, “Formation of the terrestrial planets,” Annual Review of Astronomy and Astrophysics 18 (1980): 77–113. Abstract available online. Retrieved December 26, 2007. ↑ S. Inaba and M. Ikoma, “Enhanced collisional growth of a protoplanet that has an atmosphere,” Astronomy and Astrophysics 410 (2003): 711–723. Abstract available online. Retrieved December 26, 2007. ↑ S. Kenton and B. Bromley, Dusty Rings & Icy Planet Formation, Smithsonian Astrophysical Observatory. Retrieved December 26, 2007. ↑ Brad Amburn, “Behind the Pluto Mission: An Interview with Project Leader Alan Stern,” Space.com Feb. 28, 2006). Retrieved December 26, 2007. ↑ “Scientists reveal smallest extra-solar planet yet found,” SpaceFlight Now (Feb. 11, 2005). Retrieved December 26, 2007. This page was last modified on 29 March 2019, at 20:55.